I don’t know about you, but if your household is anything like mine, we ALWAYS end up with a little bit of chicken leftover after a sunday roast. The amount though is not enough to have a full on meal again, but there is enough to make a meal from it………………if you get my drift. 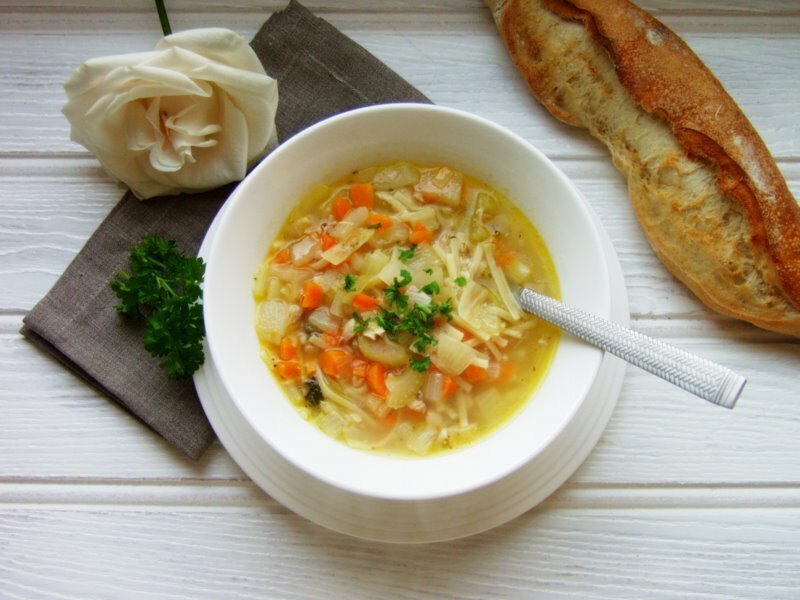 One dish which is great for leftover chicken (or by all means buy a couple of chicken breasts and create if from scratch) is ‘chicken noodle soup’, which accompanied with a fresh baguette to dunk in the juice, certainly hits the spot. Its a great Monday night supper and takes no time to prepare and is a feast for all the family to enjoy and share. As November fades away and Advent waits eagerly in the wings, I am sure that some good old fashioned comfort food like chicken noodle soup will help us all get through those Christmas engagements that we eagerly accepted. It’s only when we have our diaries in front of us that it begins to dawn on us that perhaps we should have accepted less and had a night in. So, one and all, let us prepare our bodies, minds and spirits for the great social quest that lies before us: the month of December. Do you have a favourite comfort recipe that warms your cockles and boosts your immune system? 1. Remove all the leftover meat from the chicken and cut into small bite sized mouthfuls and place to one side. Put the remaining carcass in a casserole pot and add the herbes de provence and bay leaves and cover with boiling water. Simmer gently for 30 minutes and then strain off the liquid. This will become the basis for your soup. Discard the remains of the chicken. If you do not have a leftover chicken to make stock I find bouillon vegetable stock works wonders. 2. Using the same casserole pan, add a glug of olive oil – basically enough so that it pretty much covers the bottom of your pan. Add the onion and let them sweat on a low heat, stirring occasionally. After 5 minutes, add the garlic, carrots and celery stalks and continue to stir. ONLY if you are using fresh boneless chicken breasts – add them at this stage. Place the lid on the casserole pot so that the vegetables really get to sweat. After 3-4 minutes, add a couple of torn sage leaves, rock salt and a good amount of fresh black pepper. 3. Add the chicken stock, which should be between 3-4 pints. Put in a small amount at a time and continue to add until you have the consistency that you like for your soup. Please note, however, that when you add the dried pasta it will soak up a fair amount of the stock, so you need to put in a little more than you think. You will not need more than 4 pints though altogether. Even though I made fresh stock I often like to add a little vegetable bouillon (stock cube), to give it an extra boost. Apologies to you purists out there! 4. Break a handful of dried spaghetti/linguine into the pot. Keep the lengths around 3cm in length. Add half a lemon, squeeze it as you add it to the soup. Stir the soup and gently simmer for 10 minutes or until the pasta is cooked. In the final few minutes add the chicken to the soup and mix all the ingredients together. 5. Serve piping hot in bowls with a scattering of freshly chopped parsley and a baguette for dunking. 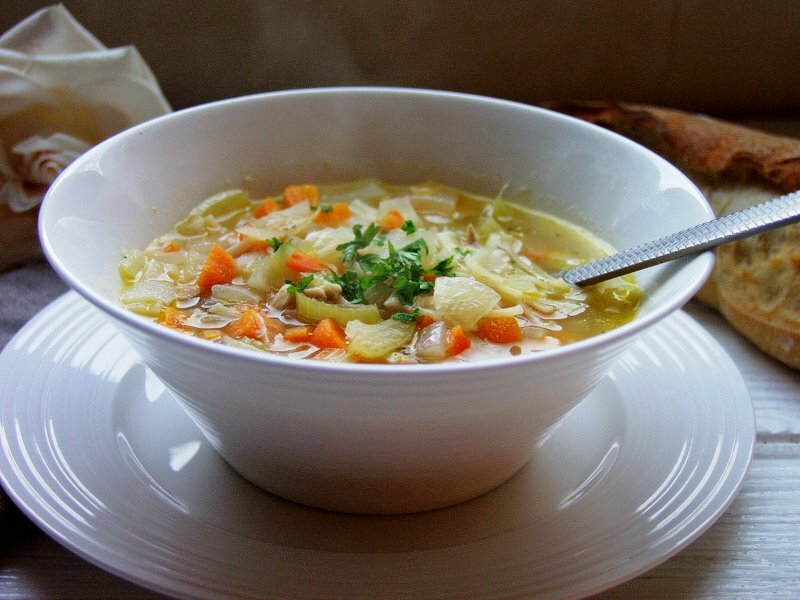 This entry was posted in Chicken, Soup and tagged celery stalks, chicken breasts., chicken noodle soup, christmas engagements, comfort food, herbes de provence, leftover chicken, stock cubes. Bookmark the permalink.